The Boothbay Railway Village is a great place for a field trip! Your students will have fun and learn how technology has changed the way we live and work. We are happy to extend discounted pricing to school and youth group programs for a visit to the Museum. Please plan to bring plenty of staff and chaperones to provide a safe and interesting experience for your students. To help make that easy for you, there is no charge for adults when you book a school or youth group in advance. Please pay with a single-form of payment in advance or upon arrival to qualify for group rates and the free chaperone program. 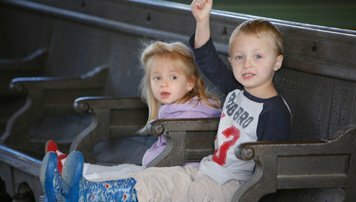 For public and private school groups, we offer a choice of themed tours and/or class activities for Pre-K through Fourth Grades. The programs highlight how the Industrial Revolution has changed our lives. Each program is tailored to the grade level of the class. There is no additional charge for themed tours. There is a small materials fee for class activities. For a detailed program description and reservation packet CLICK HERE. To book a group visit call us at (207) 633-4727 or email staff@railwayvillage.org.